In cool weather, cream rose to the top of the milk pan. Cream was skimmed from the top, placed in a butter churn, and stirred energetically until it became solid butter. This work was done mostly by women. Not all awards were in the form of ribbons and medals. 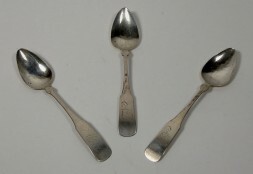 This set of tea spoons was won by Amy Dunham in 1817, at the first Otsego County Fair. 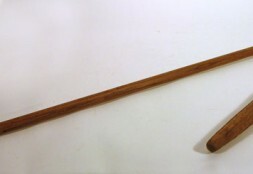 She was awarded the set of spoons for a “double damask tablecloth,” which she had woven. Made of silver, the spoon handles are engraved with her initials, A.D. The milk produced at Fenimore Farm had one of three destinations. 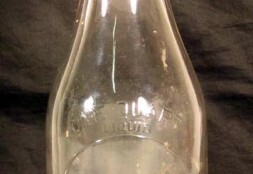 Some was bottled and sold locally and regionally, while other milk was bottled and shipped by rail to The Dakota, an upscale apartment building in Manhattan that Edward Severin Clark owned. The rest of the milk was sold in bulk to larger dairy producers. 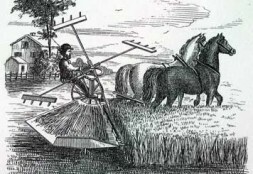 Patented in 1865, the adjustable switch reel rake was intended to make reaping grain more efficient for farmers. Although some farmers used steampowered machines by the 1860’s, many still used horses or oxen to power the equipment on their farms.